I have tried this stuff maybe 10 different occasions and not once have I had success! I've used the glue and the epoxy. Results are always the same; takes forever to "set up" and always fails! Garbage. Not good at all. One, it takes too long to dry, and the adhesion is not that good. I think Super Glue is the best without a doubt, so if you’re looking for something that sticks quick and is long-lasting, it’s got to be the best, Super Glue. Not so great at all! 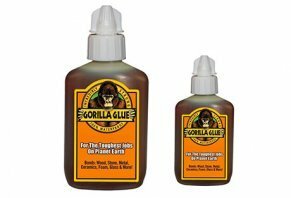 I have used (or tried to use) Gorilla Glue several times, and I can and will say that this stuff is not that good at all!! First of all, as it dries, it swells up a bit, didn't expect that to happen the first time I used it, so you must use it sparingly. It also does not keep it's "grip" very long! I spent $8 for just a tiny bottle of Gorilla Glue to glue two things back together, one was for two small wood pieces of mom's nic-nac, and the other was a ceramic handle on a small, lightweight sugar bowl. Both came back apart in no time at all, even after following directions very carefully and waiting days for the glue to really cure and harden! The next time I went to use the very small $8 bottle only a couple days later, the entire bottles contents was all dried up and hardened inside the bottle, so it apparently has a very short shelf life once you open it! I will NEVER buy their garbage ever again, and will just stick to the cheap $1 tubes of "super glue!"